So The Man Beast rolls over to face me the other morning and says, "Do you know that otters hold hands when they sleep to keep from floating away?" "Really? ", I said, "How do you know?" TMB shrugs. "I read it online, somewhere." I did some research and TMB is indeed correct. 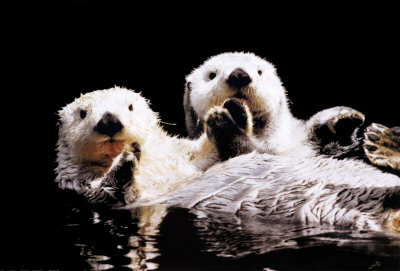 Otters are some pretty cool creatures. Not only do they have the thickest fur of all mammals (1 million hairs per square inch compared to our 100,000 follicles on our whole head) but they are also the only other mammals beside primates to use tools. They will lie on their backs and beat a clam against a rock until it breaks open. Industrious little creatures, no? I think it's amazing that they are wise enough to know that they need to "band together" while they sleep lest they float away and fall prey to other animals. After having this morning conversation with TMB, I have started thinking about my own relationship with my husband. The Man Beast and I have been living like otters for the past 14 years. Every night, I will wrap my foot around TMB's. I do not remember a time in our marriage that I have not done this. This is our way of connecting to one another regardless of anything that might be keeping us apart (fatigue, sickness, etc). It is our way of holding hands so that we don't float away. Life gets hectic. If you're not careful, you will drift away from those you care about unless you consciously make the effort to connect. The connection doesn't have to be extravagant; it just has to be meaningful to you. So very true, gf! Thanks for sharing. I was just made aware of this fact recently and about melted when I saw it on youtube. Your post is lovely and keeps me from becoming a bitter single gal. I'll definitely find my otter. I really liked this. Very touching. And some otter trivia to share with the kids, too! @Terry, fun trivia to share, indeed!